In High School, I continued to explore black and white film, and loved every minute of it. I excelled in the darkroom. When I left Uni after only 6 months in fine art Photography, I put down the camera and didnt pick it up for a very long time. When I did finally go back to the camera it was digital and nothing else. This is now changing though as I am starting to shoot more and more film. Its an interesting thing, and something that a lot of people probably dont even think about. I was a part of the last generation to grow up without digital cameras being the norm. I was one of the last generations to know what film is, how it feels, and have been lucky enough to see hundreds, or maybe even thousands of slowly emerging black and white prints develop in trays and expose themselves in all their wonder. That final piece of the slow work flow puzzle that is the end to end process of film photography. Its the way things should be I think. Dont get me wrong, digital has its place. I shoot a lot of it. Digital will always be here, and honestly, we are one day going to see a time when there is no film available. So, I guess on that note, I might even be not only the last generation to really know what film is, but I also might be the generation that sees it die off into extinction. Film photography, and the whole process is something that even if as a Street Photographer, you never even touch, feel, and experience it, you should understand it. You should understand the feeling of taking a bulk load 35mm cassette and rolling your own film. The process of loading that film canister into a camera, both a SLR style hinged back, as well as a rangefinder style with a drop out plate, rather than just shoving a SD Card into a camera. You should understand the process of loading that same film in a dark bag, onto spool, carefully measuring out chemistry, checking temperatures, and counting down the minutes, slowly inverting the developing tank at the required intervals as you wait to see if you have achieved the results you were after. This process in itself is so different from coming home from shooting, taking a memory card full of goodies and dumping all the images to Lightroom and jumping straight into the editing process. You should understand the real process of dodging and burning, not the dodge tool in Photoshop. You should understand the difference that selecting a yellow, orange, red, green, or blue filter will make to a black and white film image, not just how applying these filters after the fact to a colour image converted in Silver FX. You should know what happens when you select a different Multigrade filter when making a darkroom enlargement, not just how to increase the contrast setting in Lightroom. And I think, most important of all, everyone should know that feeling that you get when you hang your prints to dry. Its something that makes all the senses come alive. You walk out of the darkroom with your print, into the light, and see what you have made (I swear I used to be able to judge this in the darkroom years ago, but alas, this is a skill that seems to have escaped me, natural light is required these days). Im going to run through some of these things for you, and Im going to take you through the end to end process of the recent shots that I processed in a 6 hour stint in the darkroom. I have touched on the things that I am going to talk about above, but I will expand a little as we go. I have 2 of these at the moment, and have just picked up a 3rd for a really good deal on eBay. These are things that do come up every now and then, so its worth keeping your eyes out. Why 3 I hear you say? Remember, one of the main differences between shooting film and shooting digital is that with a digital camera you are able to set a range of ISO settings on the same film (sensor). With film, you load a roll of film in the camera, and that your ISO setting till that roll is gone. You are able to push and pull the film in the exposures, but you have to apply this to the whole roll in most cases as the development time of the film will need to be adjusted for the exposure setting that you used. There are some films that have a wide exposure latitude that allow you to make small adjustments to get the shot however, but these are no where near as flexible as a digital sensor. Keep in mind that as your ISO increases so does the grain in the film. Much the same as the noise in digital, though a whole lot more pleasing to the eye I have to argue. I have 1 loader with 100iso, one with 400iso, and will load the 3rd when it comes with a different 400iso film. The process of loading film is pretty simple when you have done it a few times. You basically just stick a little tail of the film from the loader to the spool with some masking tape, put the canister back together, then put it in the loader and roll the film on. Some rollers have counters to show you how many shots you have rolled. So much more hands on, takes longer, and gets you ready for the fact that you are about to embark on a process that is a lot more time consuming than digital, but I find it cathartic. Thats it, we are ready to go shoot! Shooting I am going to pretend that you have the whole shooting bit down pat. Its really not a lot different to shooting digital, but I will remember to write a post on the main differences at some point. However, there is one key thing that I would like to cover... Filters. Have you ever seen a set of these? These are filters that screw onto the end of your camera lens (all lenses have different diameter filters, so check before buying). We are shooting black and white, so whats with the colour? Weird right... The thing is, each black and white film emulsion has a different sensitivity to different colours in the colour spectrum, even to the point where film can be sensitive to infrared light that isnt even visible to the human eye. As a basic run down, red filters create more contrast, and they also block out blue light, so will turn a blue sky black. Blue filters are basically at the opposite end of the spectrum, and will turn a blue sky white and block red light. Keep in mind that exposures will need to be adjusted to allow for the reduction in light thats available for the film, a red 25 filter for example requires about a 3 stop adjustment in the exposure, so if you were shooting at f16, then you will need to open the lens to f5.6 to get the same exposure if you want to keep your shutter speed constant. For you digital guys, there are setting in one of the best software programs out there that will achieve this result for you after the fact. When you convert a colour image to black and white using Silver FX Pro2, you are able to apply filters to the image. The screen shot below shows where these settings are in the program. On the right of the screen you can see both the colour filters, as well as the film colour sensitivity adjustments. These allow you to highlight a certain area of an image based on what colour it was when it was shot in colour. These settings only work if you send the image from Lightroom as a colour file, so dont convert to black and white in Lightroom and then send to Silver FX, as these wont work, and for me they are the best little sliders in any digital photo workflow, period! When shooting film, you have to have the foresight to be able to look at a scene and select the best filter for the situation before clicking the shutter. Once you expose that shot, you cant do a lot to change the effect that the filter has had on the exposure. There are a few tricks in the printing process, I will cover these in more detail below. Thats enough on the shooting difference, lets move onto processing. Processing FilmIm not going to go into details about the process that involved in this post, there is some really good posts out there on the net about how to do this, and most developers come with some form of instructions. If you want to have a read of one of the better descriptions of the development process, then you can have a look at what Bellamy from Japan Camera Hunter has put together. You can also get development times for most films from Google searches, and lots of details about different techniques on various forums.What I will cover is the differences in the process, or the things that I tend to find are the parts of the process that I just enjoy. Dont get me wrong, its tedious. I get the whole instant gratification from digital thing, but is that really why you are taking photos. I know that for me there are things that you can do with a digital image that make it a lot easier to use that medium (application of colour filters after the fact, as detailed above for example). I at least have the knowledge of how to do it the hard way, so a little more respect for the process and the steps that I am cheating when shooting digital. Dont get me wrong, this might not be important to you, but if you have read this far through my ramblings, then I dare say that it is. Thats what I am hoping to give you here. Bellamys blog details all the equipment that you will need, but lets just say that for me, the enjoyment out of the processing process is that the procedure of achieving a perfect exposure with film doesnt just stop and start with the click of the shutter on your camera. This is a step that is missing from digital, its the step in the digital process where you download your images to your hard drive I guess. With film, you may have been able to expose that shot perfectly. You might have metered correctly, been spot on with the focus, and selected the right settings technically, and framed everything to perfection. You also have to then process your film, and there is so much that is able to go wrong at this point as well. I like this step. I like following the step by step measurements that I have done so many times, and meticulously ensuring the concentration of developer to water is correct, the temperature is what I wanted it to be, and the time is also correct. Keeping track of the time and inverting the tank to hear that sloshing feeling every 45-60 seconds depending on your desired results. Its a tactile thing, and its a process that I enjoy. Then there are the smells. I honestly had forgotten the joy that I get from smelling fixer in my house. I dont think that my wife feels the same, but hey, Im an artist, its all about me right?So, I have touched on the fact that the exposure process doesnt stop at the click of the shutter, but what does this mean? Granted, there is a stock standard way to process a film, and initially I would suggest that this is what you try as a beginner. But there is so much more you are able to try as well, and it all starts to widen your ability to express yourself with this wonderful medium. Some of the things that you are able to adjust are the temperature of the water (development times have to be adjusted as well). Developing for different times in a different temperature will give you the same exposure results, but they will differ in contrast and grain. You can also change the inversions that you use, this will also change the development time, contrast and the grain of the end result. You can do this down to no inversions if you like, and this is called 'stand development' and works welll with some film/developer combinations. You can change the development time depending on the way you exposed the film as well. So if you were shooting in low light with 400iso film and you didnt quite have enough sensitivity in the emulsion for the light you had available, you can under expose the film, and the adjust the development time accordingly. This is called push processing.You can even develop film in things other than developer if you want to give it a go. I found this article today on The Phoblographer that details some really cool results developing in some really weird stuff. I mean sure, you could do that in Photoshop, but would it be as fun? Hell no!Darkroom PrintingThis is where things get fun. And this is also likely the spot where some of you will opt out of this process. This is for many reasons, cost, time, and most of the time, just the lack of availability of a darkroom. For the guys that do opt out, there are many options for high quality scanner available on the market that will allow you to digitise your film and process it as normal using a workflow that you are used to, I would argue that this is still a massive step in the understanding of the film photography process. But if you are like me, then you will want to print at some point as well.I will say this up front. Darkroom printing is a long process. It takes way longer to get a result that you are happy with if you expect high standards. However, its worth it. The end result just looks different. Its organic and pleasing to the eye for me to look at a great printed black and white image. Its the same argument as why you should buy books rather than looking at images online all the time. Backlit images are not the same. There is something about a good print that is just better. Its real, you can touch it and feel it. There are a lot of things that you do in the darkroom that you still do in software, and to be honest, the software developers did the history of the art form some sort of justice with their naming conventions. The dodge tool in photoshop for example, and the colour filter in Silver FX. These both use terms that are straight from the film workflow.I spent 6 hours printing and framing these images yesterday, and I will use it as an example of what I am rambling about here. The scanned images above are of the Gelatin Silver prints from the darkroom, they dont do them justice, so please dont look at them as the end result. The Melbourne Silver Mine is a film photography promotion club in Melbourne, and I am a member. The guys there have been kind enough to organise for a space to hang some work at a upcoming photography show. I have a space on a wall and this is what I will be showing. I started to print the images after scanning them in, and then thought to myself, we are about promoting the art of film photography, and I think that the forgotten art of printing in a darkroom is something that should be involved in that promotion. So I took the time, and printed in the darkroom. I tell you, I am really happy that I did it. 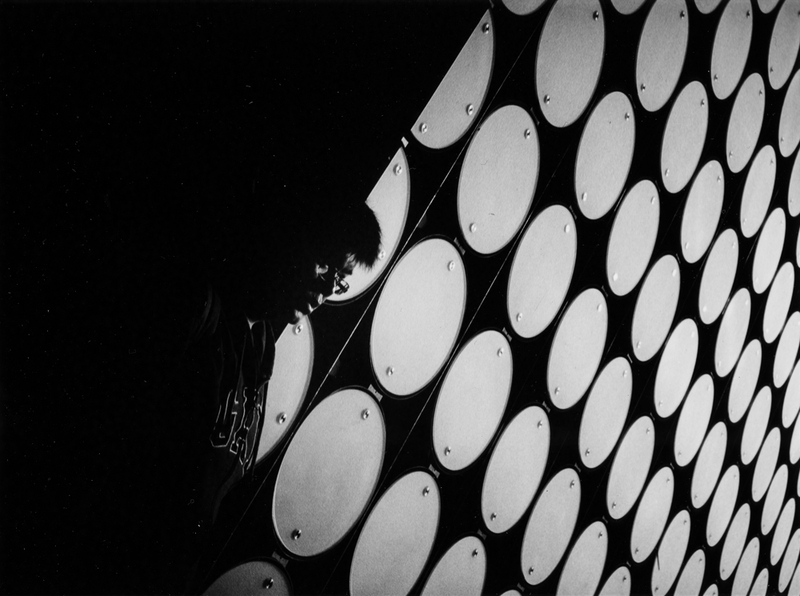 I must say that I take a lot of pride in the end result, and the fact that I am still able to achieve a result in the darkroom that I am happy to hang on a wall for people to look at. What you do in a darkroom, you are able to do to an extent in Lightroom. This is of course Adobes answer to a digital solution for darkroom technicians. The difference being that you have to do test strips and change the settings in a consistent and repeatable process in the darkroom, you cant just slide a slider on the computer screen and see your whole image exposure or contrast change. Enlargers are sort of like a second camera in a way, the lens has aperture settings and you focus the image, much the same as a camera. The less light you let through the longer your exposure will need to be, but this allows you more room for error in the exposure as well. Most of the images in the 'Dots'series were exposed at f8, and for between 1 min and 2 min depending on the shot. This exposure also included some dodging on the faces of the subjects to make sure that I was able to save sufficient highlights and detail. As well as some burning of the dots to make sure that the highlights in the dots were not blown. The images were all exposed using a number 5 filter. You use these filters to change the contrast of the paper. 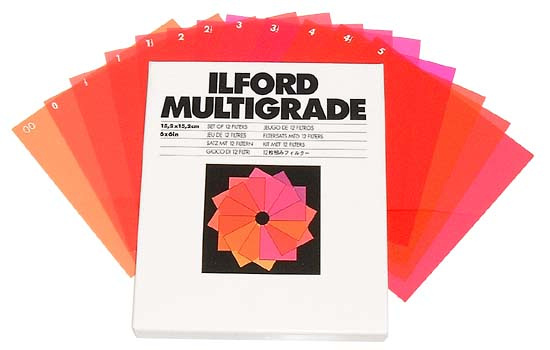 This is something that Ilford developed a long time ago. Prior to multigrade papers, you had to have different papers to get different contrast in the final print. In the darkroom things just take longer. You have to do a test strip, starting with some settings that you think will be correct, and then assess the strip after a few minutes in the developer/stop bath/fixer process. After making the assessment you need to make the appropriate adjustments to the exposure times, filters, and so on, and then start again. The process does speed up as you go if you are working on similar negatives, but its still lengthy. You then have to work out if you need to dodge in certain areas of the image and burn others to get an even result. At this point you start using both hands to work different shaped tools (usually bits of card board cut in the required shapes and stuck to some thick wire for me) around the image to let light hit one part of the paper but not the other. Its a complex and intricate process, and I think thats what I enjoy about it. Conclusion In 6 hours in the darkroom yesterday I got done what I likely could have achieved digitally in about 2. Is it better? I think so. I am really happy that I spent the time, and Im going to start to do more of it. I dont want to forget this skill. I think for me there is also just a sense of comfort and belonging that I feel from being in the darkroom under the safety lights. I spent so much time in there in high school, that I just feel comfortable and at ease. It makes me happy.I think that there are a few things that you can take away from the above. But I am going to point out two that I think are important.1. Gain an understanding of the process that has built the digital solution that you use. It will build a sense of respect for the technicians and chemists of the previous 100 years and what they were able to achieve without the technology that we have access to.2. Even if you dont try your hand at film photography, print more of your work. Dont just look at your work on a screen. Print out prints. Frame them. Hang them on the wall at home. Look at them in the right sort of light. It will help you gain a better appreciation of the right exposure settings and tones.And to add to the above, buy books... So many people go on about buying books not gear. They are right. Look at images on quality printed paper, and enjoy them the way they were designed to be viewed.